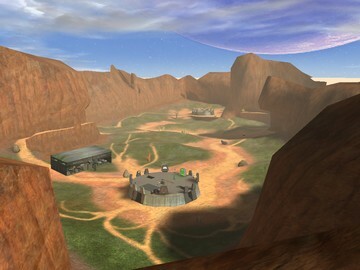 Description: A Blood Gulch variant with modernized weaponry for a different style of combat. in combat today, such as the M16/203, M4, M249 SAW, RPG, Desert Eagle, Etc.I also added hog bases next to each base, Each of which have modded hogs with the ability to gun while you're driving (both rocket and turret hogs). A new feature you got to see is this flying ghost (modded by Me [KS]) which replaces the banshee. I did fix a lot of bugs with all these weapons and added crosshairs for most guns for game play.